A Creative Cookie: monster pouch and happy halloween! monster pouch and happy halloween! Happy Halloween!! I hope you're having a great one! In honor of this spooky holiday, I will share with you a fun d.i.y. 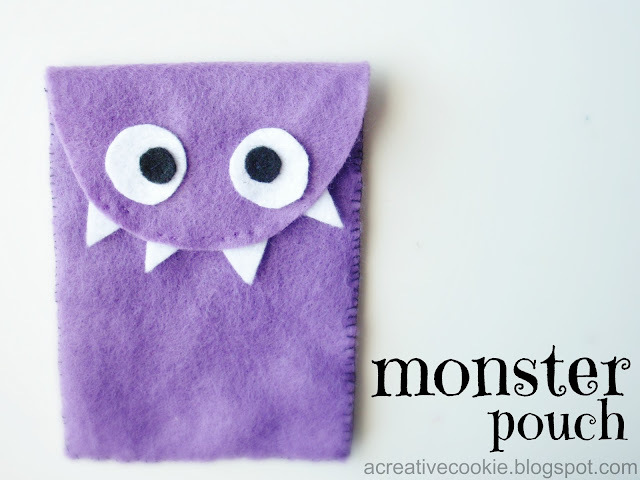 monster pouch that can be whipped up any time! Step 1. Cut out your felt pieces. Start with a rectangle (it can be any size, depending on the size you want your pouch to be) and then cut another piece the same size, with a half circle added to one end. Step 2. Cut out four circles for the eyes and some triangles for the teeth. Step 3. Sew the shapes on the rounded flap. Use same color thread as the felt (I needed purple and black). When you sew them, don't pull the thread too tight or the stitches will be easily spotted. Step 4. Sew the velcro on the top rectangle and under the flap, so when the flap is shut, the velcro pieces will stick to each other. Step 5. Sew all around the edges of the pouch, leaving the area underneath the flap open. Ta daa! Isn't he cute? You can use your pouch as a goodie bag, coin purse, or to hold any small items. Tonight I'll be hanging out with some friends who hand out free books instead of candy in their front yard! How cool is that?! What are you planning to do tonight? If you've already done it, how'd it go?